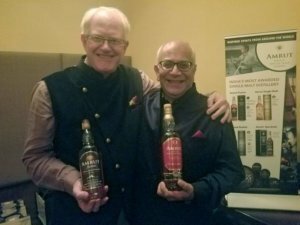 Business partners Raj Sabharwal and Bill Campbell, who launched Amrut in the US, in 2010, at the whisky dinner, at Junoon, in New York City, on October 1, 2018. All Photos: Sujeet Rajan. 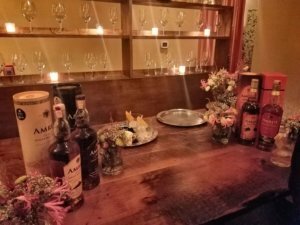 NEW YORK – Amrut, India’s top single malt distiller based in Bengaluru, held a lavish whisky dinner and launch at Junoon, the only Michelin starred Indian restaurant in New York City, on October 1, 2018, where they unveiled their newest expression, Amrut Madeira Cask Finish, a limited single malt aged in Portuguese madeira casks, which will hit select US stores and high end bars and restaurants later this month. The retail price will be around $150 for a 750 ml bottle. The dinner itself was a memorable one with Ashok Chokalingam, Amrut’s Whisky Innovator and Assistant Distiller, giving a lecture through the course of the dinner, of the distillation process of the expressions made in Kambipura, a village on the outskirts of Bengaluru. Amrut single malt bottles laid out for sampling at Junoon. A select audience partook of delicious courses concocted by Junoon’s Chef Akshay Bhardwaj, paired with Amrut’s four different varieties of single malts – Amrut Class, Amrut Fusion, Amrut Narangi and Amrut Madeira. A welcome cocktail drink during the preceding reception featured Amrut’s excellent ‘Narangi Rum’, made from orange bitters. Also present at the whisky dinner were business partners Raj Sabharwal and Bill Campbell, who launched Amrut in the US, in 2010, and have never looked back from the huge success it’s tuned out to be. 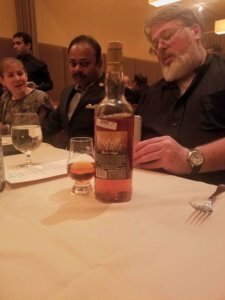 Ashok Chokalingam, Amrut’s Whisky Innovator and Assistant Distiller (center), at the whisky dinner, at Junoon. Chokalingam, who revealed that Amrut will soon open a new distillery in Bengaluru, traced the history of the fascinating process of distilling the various single malt expressions of the company, which is now sold in 24 states in the US, and an equal number of countries globally. Amrut, a term the company deemed ‘Elixir of Life’, in ancient Hindu mythology connotes ‘Nectar of Gods’. Today, India has the distinction of consuming more whisky than any country in the world. In 2018, the Scotch Whisky Association reported that India is currently its third-largest export market. According to Vine Pair, over the past five years, whisky sales in India grew by 15 percent. 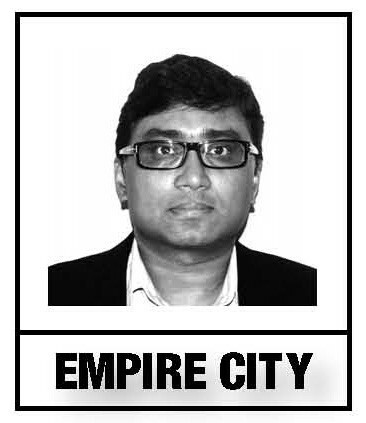 Indians consumed 1.5 billion liters of whisky in 2014, versus America’s 462 million liters. 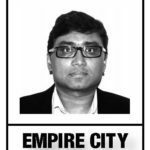 However, the most innovative expressions made by India’s sing malt distillers, including Amrut – founded by Neelkanta Rao Jagdale and his son Rakshit, are mostly confined to the international market. Amrut’s signature product, Amrut Fusion, took off globally after it was awarded the Best Natural Cask whiskey in Daily Drams (under 50 pounds) category, in 2009, and a bigger accolade came up next year when Jim Murray declared Amrut Fusion the third best in the world, in Whisky Bible, giving it 97 out of 100 points. Murray rated Amrut after sampling 4,000 whiskies from across the world. It’s made from barley imported from Scotland, as well as from India. It’s no wonder then that Amrut Spectrum, an limited edition single malt created by Chokalingam, in 2016, and named World Whisky of the Year by Whisky Advocate, was sold out in no time, as connoisseurs couldn’t get enough of it. Reportedly, another Spectrum will be available in 2020. Campbell revealed to News India Times that the 200 odd cases of the select edition of Madeira will most likely be sold out within days in the US, as there is more demand than supply for it. The launch also revealed a new look for Amrut Fusion, the signature brand which is increasingly its presence in stories around the US, and has proved to be a hit in the retail market. Lamb chops, served with honey crisp apple and mushroom puree. 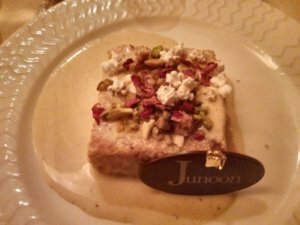 The food pairings by Junoon for the whisky dinner was terrific. 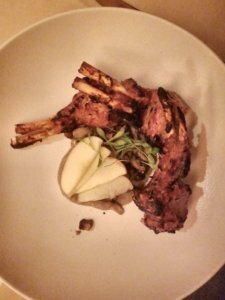 There was choice of Saloni Macchi, and eggplant chaat to go with Amrut Classic, while the entrée had selections of Nizami paneer, Malabar shrimp, tawa black bass and the succulent and popular lamb chops served with honey crisp apple and mushroom puree. They were paired with Amrut Fusion, and later with Amrut Narangi Single Malt. Dessert, which comprised of the ‘Drunken Shahi Tukra’, a delicious cake sprinkled with saffron, Amrut rum, and cardamom rabri, and doused in butter and ghee, did justice to the excellent Madeira Cask Single Malt, which made the evening a resounding success.